Featherbrained as the boy may have been, you have to admit that he did express some logic in his line of thinking. For one who obviously knew little about the value of currency, it would appear that the higher number of coins obtained = the more riches secured. Yet the opposite was true. 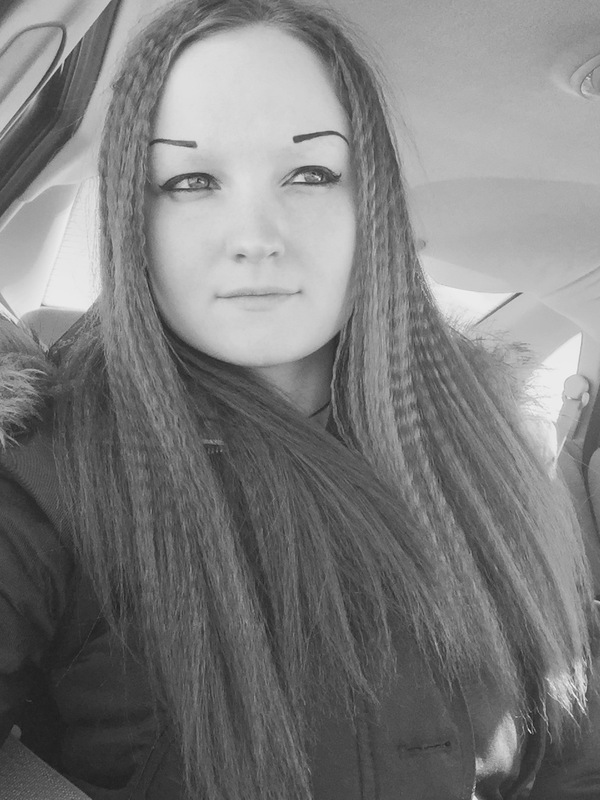 What he viewed as his gain, was ironically his loss. All of his efforts turned out to be wasted, for he did not educate himself in monetary value. I must die to live? I must give to get? I must humble myself to be exalted? I must go last to go first? I must be poor to be rich? Less me will bless me. When it comes to leading others to Christ, we tend to lean towards one of two methods: distressing, or professing. The first is a “beat ’em over the head” approach. Many people mistakenly believe that the best way to win people over to Christ is by putting worldly ignorance to shame by entering into arguments with non-christians. They think they are doing the work of God, but they act more like a soldier headed into mortal combat. The problem with the approach of distressing is that someone always comes out dead; not with newfound life. The latter approach (professing) has every bit as much zeal, but with the crucial addition of shrewd gentility. A person who professes rather than distresses knows that “the best defense is a good offense”. Instead of arguing and trying to defend our moral position, we ought to be in the business of showing why Jesus is the way, and glorifying his attributes. When we lead others, we must focus first on leading them to the person, not the principles; the savior, not the system. When hearts are true, both will come with a little time. We read in Job 34:3 that “…the ear trieth words, as the mouth tasteth meat.” Considering words in comparison to food, the words by which we speak to those outside the fold should be such as to make them want to take another bite of our teaching, NOT spit it out. Our words should be true, yes – but not only that – also well-seasoned and palatable. Like it says in Proverbs 16:23-24, “The heart of the wise teacheth his mouth, and addeth learning to his lips. Pleasant words are as an honeycomb, sweet to the soul, and health to the bones.” Are we teaching our mouths to speak pleasantly towards those are without? Are our lips learning the art of honeycomb evangelism…speaking in a way that is both sweet and healthy (filled with a palatable balance of spirit and truth)? Proverbs 11:30b states: “he that winneth souls is wise.” The pursuit of evangelism is all well and good, but there must be “a method to our madness”. Not just any Joe Blow can win souls – it takes a wise individual that focuses more on professing than distressing. In other words, a wise christian is more interested in winning souls than arguments. Ask yourself: Am I striving to be the light of the world, or the leader of the debate team? If I make myself the center of attention by making other people look foolish and myself look wise, I will win no one. However, if I make Christ the center of attention by making Him look glorious and the world look unappealing, then I am on to something. Less me will bless me with my ministry. If we are not careful, many of us will at one point or another fall into a rut of apathy and laziness. At the core of our fleshly sin nature is a selfishness that runs deep. Our selfishness causes us to be spiritually lazy. When given the choice between the spiritual and the carnal, we often lean toward the carnal. Sure, we may not go so far as to choose going to night-clubs over night-church! Yet selfishness is often much more subtle than extreme. In reality, selfishness comes down to the little choices we make from day to day, such as binge-watching television when we really should be studying, or falling asleep instead of taking time to talk to the Lord. Sometimes it seems harder to choose the right thing than the easy thing, but remember – less me will bless me! If we stop digressing and start progressing, there are rich rewards to be had. We all know these famous words of our Lord: “where your treasure is, there will your heart be also” (Matthew 6:21). What we need is a perspective change in regard to spiritual things. If we learn to treasure spiritual things, then our hearts will be in it. If we wait until we feel like choosing the spiritual over the carnal, we may be waiting a long time! We must train and guide our feelings, rather than letting them have the reins. First we change our minds; then our hearts (and furthermore, our feelings) will follow suit. 2 Timothy 3:5 warns us of those who “have a form of godliness, but deny the power thereof“. What if that person he warns against is you, or me? Do we at times deny God’s power by putting low priority on spiritual pursuits? I think all of us undervalue the spiritual at times because we simply do not see the results of our efforts right away. Our flesh causes us to quickly think “this is boring” when we don’t see any real pleasure or worth in what we’re doing. Then we run to our televisions, video games, books, or any other vice we might use in order to distract us from the eternal. Things that bring instant gratification. Yet it’s like my father always used to say: anything worth doing takes time. If we deny our flesh in the present, we will reap great spiritual benefits before we know it! When it comes to choosing between the hard choice and the easy choice, always choose the hard thing first. Perhaps you think to yourself: “Hmmm, should I spend some time reading my bible, or browsing social media?” Read your bible first, and I guarantee you will be able to muster the energy for browsing later! If you browse first, you are more likely to get sucked in for longer than is prudent. We seem to always be able to make time for things we love doing. Therefore we must be intentional about loving the things of God – every time we deny our flesh it will get easier and easier to choose well. As our nation had such fervor for reaching spatial heights, ought we not to have even greater fervor for reaching spiritual heights? Less me will bless me with my moments! If you asked most anyone if they would rather have less cash flow or more, it’s fairly easy to guess what their answer might be. Who doesn’t want a little more bread in the billfold? Truly, everyone’s life is affected by money in some fashion, and we all need some to get by in this world. Yet how do we know when enough is enough? What if money has become an idol in our life? Psalm 73:12 gives us this sober wake-up call: Behold, these are the ungodly, who prosper in the world; they increase in riches. Now does this mean that only the beggars and the homeless will enter into Heaven? Of course not. Yet consider the heart of the matter: those who have prospering in the world and increasing in riches as their main focus are not God-minded individuals. Now, should we seek to provide our family’s needs, and even bring small joys to our household in the form of innocent wants (in moderation)? Absolutely. However, if money comes between our faith, family, or fidelity, it has taken a wrongful place in our lives. Like the passage states, riches are “uncertain”…they can come and go. How foolish to trust in uncertainty, when we can trust in a certain and living God! Better to be poor in this world and rich in the next than vice versa! The funny thing about money is it seems that no matter how much a person gets, they could always use a little more, and a little more. That is because money can never fully satisfy us. Only God has the power to fill us all in all. Like Solomon so aptly penned concerning wealth in Ecclesiastes 5:16b…what profit hath he that hath laboured for the wind? Money will always leave us wanting. In other words, can money save our loved ones? Will our success in this world have value that stretches on into eternity? Won’t we someday regret neglecting others for the sake of money, when we ought to have rather been ministering to them and furthering the cause of Christ? We need to be more interested in getting to heaven than getting ahead. Less me will bless me with my money. Remember the flabbergasted father and his featherbrained son? Our Father, Jehovah God, is just as stunned by our feather-headedness when we know so little of true worth. We would be wise to follow His standard on value, because – just like in the story – sometimes less truly is more. Let us never be so featherbrained to think we are gaining when we truly are losing. Rather, in the spirit of Philippians 3:7, let us rewire our brains to count those things we used to regard as gain, to be loss for the cause of Christ. Jesus did not cling to his rights. Instead, he “made himself nothing,” became a slave, humbled himself, and became obedient to the point of death, even death on a cross. Jesus submitted. He obeyed his Father’s authority. Submission to authority expresses humility, and God always exalts the humble. So the Father raised Jesus to his right hand and gave him all power and authority. The “Less Me Life” even blessed Jesus – the King of Kings and Lord of Lords! Will we not mirror His ways as we are called to do in John 13:15-17? “Happy are we if we do these things“. Instead of distressing, digressing, and depressing; I want to spend my days professing, progressing, and possessing! Are you with me, friends? There you have it, folks. Without a doubt, less me will bless me! Sickness. If you have lived on this earth for any extended period of time, it is probable that you have been touched by it in some way, shape or form. From fevers, to the flu, to the common cold…we all despise being sick, but are hard pressed to avoid it. Try as we may, permanently avoiding any sort of malady or virus is nigh to impossible. Even the most health-conscious person can become stricken with a bout of sickness every once in a while. It’s just another result of the sin and chaos that entered the world back in the garden. Now, I want to make it abundantly clear that not each and every malady is brought on by an individual’s personal sin. There are cases where a sickness or injury is simply a recurring disadvantage of the fall and the cursed state of our world. However, whether each case is in direct correlation to our personal sin or not, would we not do well to habitually stop and consider what teaching we might gain from our maladies? Whether we are in pain, impaired, or ill paced…let each of us make a habit of using our physical bodies as spiritual teachers at every opportunity. While this is by no means an exhaustive list of all the maladies the human body may be faced with, I hope that it offers you an idea of how to search for spiritual growth in the midst of your troubles. I pray that you have been blessed by this study of sin and sickness…and of health and holiness. “Cupid” is on the move again, folks! February is upon us, and one might say “love is in the air”. Stores are lined with everything from giant teddies, to heart-shaped boxes of chocolates, to rose bouquets. 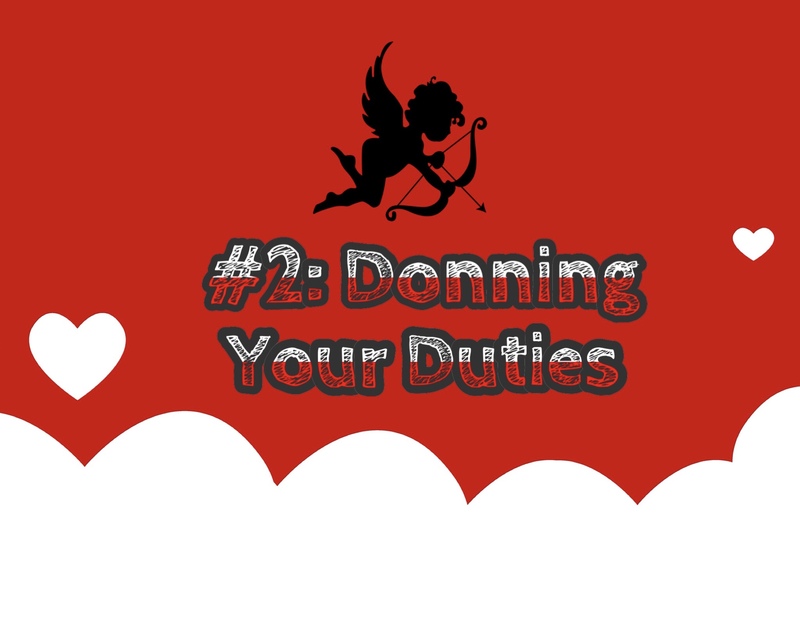 It doesn’t take a rocket scientist to get the memo – Santa Claus is yesterday’s news, and Cupid is the big man on campus now. Countless love-struck teens and desperate husbands can be found standing in every line, trying their best to score brownie points with the expectant female they fancy. Personally, I find Valentine’s Day to be completely over-rated. Make no mistake; I’ll take an excuse for a date night with my husband just as soon as the next girl. It’s not the whimsical celebration with our loved one that is wrong, but rather the worldly expectations that may accompany such a day. If a holiday is causing any of us to give in to greed, entitlement, or bitterness…then such a holiday needn’t even be on our radar. A woman who gauges her love for her husband based on the romance and gifts he gives her, is just like a woman who only loves God for the blessings He gives her. This sort of “love” is not really love at all…it’s manipulation and self-gratification. The love a woman has for her husband (as well as her Lord) should be based upon who he is, not what she can get out of him. Yet sadly, many women confuse these two aspects. Ladies! Are we children? Or are we grown women? Listen. Come what come may. We don’t have to stew. We don’t have to wallow. We don’t have to make other’s lives miserable on Valentine’s Day because of our lack of control. We as christians have the power within ourselves to move on from disappointment and get on with our day! Disappointment is a fact of life. Most of us know this basic truth, but it can be hard to remember when the moment of disappointment comes. No one likes to be disappointed! Yet when it comes to dealing with disappointment, practice makes progress! As silly as it sounds, we need to learn to invite disappointment (to a degree, you understand). The more disappointments we have, and meet head on with an attitude of acceptance and a godly joy, the easier they will be to deal with. As we mature, the things that disappointed us in times past will hardly merit a passing glance, as Jesus becomes more our focal point and trivial “problems” of this world seem less important. How many women are content with having only “food and raiment” from their man? I daresay very few. We’re all too busy whining about what we don’t have to appreciate such trifles. This is not God’s will for us. It’s time to grow up and learn to deal with disappointment. I had to laugh when I stumbled upon this passage, because it is so very true! Will we wives be gracious enough to retain an honorable attitude even when we (*gasp*) don’t get what we want? Better to have a strong man without a hole in his pocket than a pansy, browbeaten husband who rushes out to satisfy our every whim, losing his God-given authority in the process. At face value, this passage sounds extreme. Are we really to “hate” gifts? Well, in contrast to the greedy heart, the Christian’s attitude towards gifts certainly looks like hate. The message this passage is meant to convey is this: if greed is bringing strife to your house (i.e. Valentine’s Day bickering) then it’s better to “hate” gifts than to live in such a way! Gifts are meant to bring joy and harmony to a household, not contention. It has been said that “whatever you have to have, owns you“. How true that is. If Valentine’s Day is causing your house to be filled with trouble, then it’s time to say goodbye to that stumbling block so that you can live. It’s almost one and the same as “lying” when a husband feels he has to rush out and buy gifts out of a supposed duty to satiate his wife’s girlish expectations. How much more special it is when a man is able to freely give out of the overflow of his heart at any time of the year, without a nagging wife at the forefront of his thoughts. How much more precious to have a sweet, unassuming wife waiting at home that would be genuinely delighted and grateful for his unexpected and undemanded gift. Better to have a poor and kind husband than one who showers with gifts out of “duty”. Greet the day with zero expectations. The less expectations you have, the more freedom you will have. Having a peaceful, thankful, and joyful heart in all circumstances is one of the greatest gifts that you can offer to God, to your husband, and to yourself. Determine to keep a good attitude no matter what. You may not get the day you would have hoped for, but it can be a beautiful day nonetheless. Don’t let Stupid Cupid pick on you or me. Deal with disappointment, and be set free. Once disappointment has been dealt with, it’s time to show that our heart is right by our actions. One way that we do this is by putting on a cheerful smile and donning our daily duties. We know that “a merry heart maketh a cheerful countenance” (Proverbs 15:13a)…and if our heart has truly dealt with disappointment, then we can easily take on a countenance of humility and servitude. The world tells us women that on Valentine’s Day, Mother’s Day, Anniversaries, etc. that “it’s OUR day! It’s all about US!”. God’s word, on the other hand, says no such thing. In fact, we are to be humble servants of our husbands every day of the year, holiday or not. Do we have a humble and willing spirit towards our wifely duties all year long? Or do we give ourselves license to resent them when man-made holidays roll around? If the latter is true, we need to repent! We may be tempted to have an attitude toward our husband that says “he doesn’t do anything for me, so I’m not going to do anything for him.” Do not be deceived, this stiffnecked behavior is not of God, but of the adversary! Our mighty God takes none too kindly to those who puff themselves up in their foolish anger and desire for revenge. Let none of us be counted as a silly wife forsaking her duties this holiday of her own volition. Rather, let us strive to emulate the virtuous woman described in scripture. When I read Proverbs 31, I don’t get a sense of a self-entitled woman demanding pampering and “me-time” for herself. On the contrary, I see a woman who works willingly with her hands (v. 13), rises up early to prepare food for her household (v. 15),girds herself with strength (v. 17),clothes her family (v. 21), watches well over her household and is not lazy (v. 27). These are only to name a few of her many attributes! If we desire to be virtuous women that please God and our husbands, then we need more work, and less whining. Notice the phrase “after many days”? The reward for our labor does not always come right away. In fact, it may not even come in this life at all. However, there is a natural law that says we reap what we sow. We don’t know when we will reap a reward, but we do know that we will reap a reward! If our heart is right, it should give us great comfort to know that our Heavenly Father sees our efforts at all times…even when others (including our husbands) don’t. We just have to be patient, and not lose sight of our purpose in the meantime. Don’t let Stupid Cupid pick on you or me. Don your duties, and be set free. We can deal with disappointment, we can don our duties…but if we want to really make this Valentine’s Day a special day to remember? Then we must make it so. If Valentine’s Day is something important to us, then why not make a campaign to bless others rather than thinking of ourselves? There is much joy to be had in giving. Pleasing our husbands can be FUN! – If – we let it be. The more we focus on our husbands, the more natural it becomes – and the less natural it seems to be thinking of ourselves. 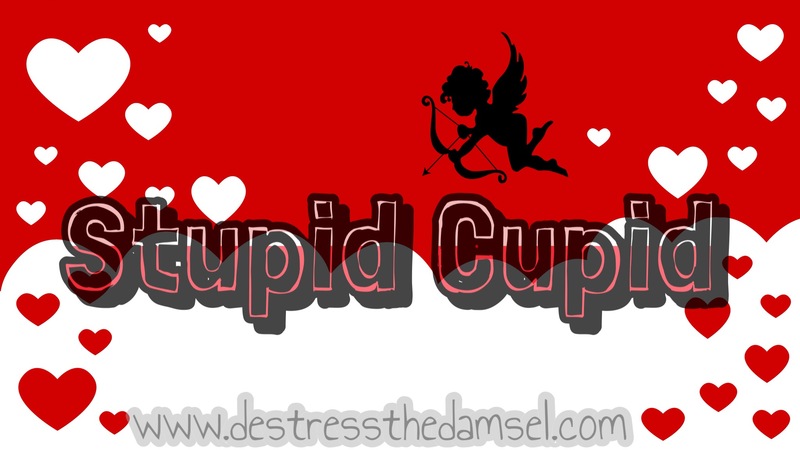 Don’t let Stupid Cupid pick on you or me. Dish out delight, and be set free.